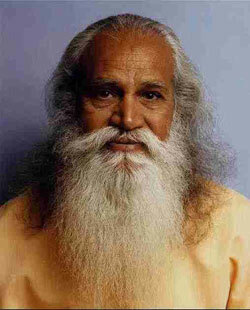 Swami Satchidananda was born in the Tamil Nadu region of southern India in 1914 to privileged and observant Hindu parents who named their son Ramaswamy. Like other children from religious families, young Ramaswamy loved to play guru and disciple with his friends. He did not become involved in spiritual matters immediately after growing up. He was a strikingly handsome, chain-smoking manager at India’s National Electric Works, he fell in love, married, and settled down to raise a family. But as with so many other worldly things, he would say that he never felt wholly attached during his five years as a householder, or as the father of two sons by the time his wife died a few years later. After his wife’s death, Ramaswamy left his children with his mother and went off on a spiritual quest that took him to mountaintops and deep into jungles and forests. For years, Ramaswamy searched out men revered as sages and saints, and spiritual masters said to be around 160 years old. He was ordained by his guru, Sri Swami Sivananda. During the late 50s and most of the 1960s, Swami Satchidananda headed the Kandy Thapovanam, an Ashram situated in the hill country of Sri-Lanka. Here, Swami Satchidananda taught his Integral style of Yoga and pursued many interfaith activities and modernized the ancient mode of living that renunciates had followed for many years–Swami Satchidanda drove a car, wore a watch and actively engaged the questions of seekers. These modernizations were at first unacceptable to many individuals in the orthodoxy but, in hindsight, were seen to be necessary for the more effective dissemination of the message of Integral Yoga. After serving his guru for many years, in 1966 he visited New York City at the request of a U.S. disciple, the artist Peter Max. Soon after his initial visit, Swamiji, as he was known to disciples, formally moved to the United States and became a citizen. From his new home he spread his teachings of yoga and enlightenment. 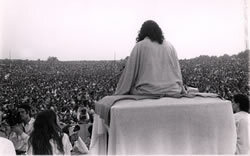 Satchidananda first came to public attention as the opening speaker at the Woodstock music and arts festival in 1969. Over the years he wrote numerous books and gave hundreds of lectures. He also ordained a number of western disciples into the holy order of sanyasa. He was the founder of the Integral Yoga Institute, and in 1986 opened the LOTUS, the Light of Truth Universal Shrine at Yogaville in Buckingham, Virginia. On August 19, 2002, Satchidananda died from a ruptured thoracic aneurysm in his native Tamil Nadu, India. However, Integral Yoga and Yogaville continue. Satchidananda’s better-known disciples included Allen Ginsberg, Alice Coltrane, Jeff Goldblum, Carole King, Peter Max, and Scott Shaw; Weezer frontman Rivers Cuomo grew up in Yogaville. Swami Satchidananda refers to his teachings as Integral yoga. His Integral Yoga is quite distinct from Sri Aurobindo’s, although the Satchidananda is thought to have briefly met Sri Aurobindo, and there are some similarities in their respective teachings.